Removal of industrial waste becomes increasingly critical for environmental protection. This study aims to search for effective and less expensive adsorbents in order to remove methylene blue (MB) commonly used in many industrial sectors. To this end, we experiment Helix aspersa snail shell as a biosorbent for the removal of MB. 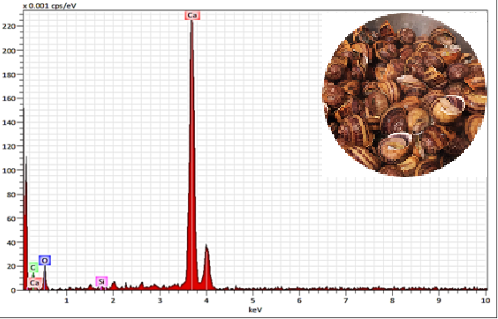 The raw snail shells were cleaned, smashed, and characterized afterwards using a scanning electron microscopy (SEM) coupled with an energy dispersive X-Ray analysis (EDX) and by X-ray diffraction. Different parameters were tested in order to identify the optimal conditions for the effective removal of MB. Our experimental results showed that, within the first ten minutes, a remarkable elimination of methylene blue dye reaching a percentage of 82%, with the following optimal conditions; 3.5 g of the adsorbent, initial MB concentration of 20 mg/L, the temperature of 15 °C, and agitation of 250 rpm. This study showed that the use of snail shell waste has inevitably a positive impact on the protection of the environment, in particular, the purification of industrial effluents. - I.A.W. Tan, B.H. Hameed, A.L. Ahmad, Equilibrium and kinetic studies on basic dye adsorption by oil palm fibre activated carbon, Chem. Eng. J, 2007, 127, 111-119. - T. Rana, S. Gupta, D. Kumar, S. Sharma, M. Rana, V.S. Rathore, B.M.J. Pereira, Toxic effects of pulp and paper-mill effluents on male reproductive organs and some systemic parameters in rats, Environ. Toxicol Pharmacol, 2004,18, 1, 1-7. - K. A. Bennani, B. Mounir, M. Hachkar, M. Bakasse, A.Yaacoubi, Élimination du colorant basique "Bleu de Méthylène" en solution aqueuse par l’argile de Safi, Journal of Water Science, 2010, 23, 4, 375-388. - T. Robinson, G. McMullan, R. Marchant et P.Nigam, Remediation of dyes in textile effluent: a critical review on current treatment technologies with a proposed alternative, Bioresour, Technol, 2001, 77, 247-255. - A.K. Verma, R.R. Dash, P. Bhunia, A review on chemical coagulation/ flocculation technologies for removal of colour from textile wastewaters, J. Environ. Manag, 2012, 93, 154–168. - G. Son, H. Lee, Methylene blue removal by submerged plasma irradiation system in the presence of persulfate, Environ. Sci. Pollut. Res., 2016, 23, 15651–15656. - S. Zinadini, A.A. Zinatizadeh, M. Rahimi, V. Vatanpour, H. Zangeneh, M. Beygzadeh, Novel high flux antifouling nanofiltration membranes for dye removal containing carboxymethyl chitosan coated Fe3O4 nanoparticles, Desalination, 2014, 349, 145–154. - Ö. Kerkez-Kuyumcu, E. Kibar, K. Dayıo glu, F. Gedik, A.N. Akın, S. Özkara-Aydıno_glu, A comparative study for removal of different dyes over M/TiO2 (M = Cu, Ni Co, Fe, Mn and Cr) photocatalysts under visible light irradiation, J. Photochem. Photobiol. A Chem, 2015, 311, 176–185. - I. Khouni, B. Marrot, R.B. Amar, Treatment of reconstituted textile wastewater containing a reactive dye in an aerobic sequencing batch reactor using a novel bacterial consortium, Sep. Purif. Technol, 2012, 87, 110–119. - N. Fayoud, S. Alami Younssi, S. Tahiri , A. Albizane, Kinetic and thermodynamic study of the adsorption of methylene blue on wood ashes, J. Mater. Environ. Sci, 2015, 6, 11, 3295-3306. - E. El-Qada, S. Allen et G. Walker, Chemical Engineering, 2008, 142, 1. - L. Kadiri, A. Ouass, Y. Essaadaoui, E. Rifi and A. Lebkiri, Coriandrum sativum seeds as a green low-cost biosorbent for methylene blue dye removal from aqueous solution: spectroscopic, kinetic and thermodynamic studies, Mediterr.J.Chem., 2018, 7(3), 204-216. - A.A. Azzaz, S. Jellali, A.A. Assadi, L. Bousselmi, Chemical treatment of orange tree sawdust for a cationic dye enhancement removal from aqueous solutions: kinetic, equilibrium and thermodynamic studies, Desalin. Water. Treat, 2016, 57, 22107–22119. - S. S. Salih, T. K. Ghosh, Preparation and Characterization of Chitosan-Coated Diatomaceous Earth for Hexavalent Chromium Removal, Environmental Processes, 2018, 5, 23-39. - S. S. Salih, T. K. Ghosh, Preparation and characterization of bioadsorbent beads for chromium and zinc ions adsorption, Co-gent Environmental Science 3, 2017, 1, 1401577. - S. S. Salih, T. K. Ghosh, Adsorption of Zn(II) ions by chitosan coated diatomaceous earth, International journal of biological macromolecules, 2018, 106, 602-610. - S.C. Wu, H.C. Hsu, S.K. Hsu, C.P. Tseng, W.F. Ho, Preparation and characterization of hydroxyapatite synthesized from oyster shell powders, Advanced Powder Technology, 2017, 28, 4, 1154–1158. DOI: 10.1016/j.apt.2017.02.001. - S. Arulvel, A. Elayaperumal, M.S. Jagatheeshwaran, Electroless nickel–phosphorus coating on crab shell particles and its Characterization, Journal of Solid State Chemistry, 2017, 248, 87–95. - Lorenz Anthony T. Fernando, M.R.S. Poblete, Aileen Grace M. Ongkikoa, Leslie Joy L. Diaza, Chitine extraction and synthesis of chitin-based polymer films from philippine blue swimming crab (Portunus pelagicus) Shells, Procedia Chem., 2016, 19, 462–468. - K. Z. Elwakeel, A. M. Elgarahy, S. H. Mohammad, Use of beach Bivalve shells located at Port Said coast (Egypt) as a green approach for methylene blue Removal, Eng., 2017, 5, 578–587. - H. Essabir, M. Ouadi Bensalah, D. Rodrigue, R. Bouhfid, Abou el kacem Qaiss, A comparison between bio- and mineral calcium carbonate on the properties of polypropylene composites, Construction and Building Materials,2017, 134, 549–555. - A.O. Nurudeen, D.A. Yekini, Snail shell as coagulant aid in the alum precipitation of malachite green from aqua system, J. Hazard. Mater, 2009,164, 1496–1502. - H. Zhou, M. Yang, M. Zhang, S. Hou, S. Kong, L. Yang, L. Deng, Preparation of Chinese mystery snail shells derived hydroxyapatite with different morphology using condensed phosphate sources, Ceram. Int, 2016, 42, 16671–16676. - G.S. Kumar, L. Sathish, R. Govindan, E.K. Girija, Utilization of snail shells to synthesise hydroxyapatite nanorods for orthopedic applications, RSC Adv, 2015, 5, 39544–39548. - M.A. Dasgupta, K.M. Purohit, Synthesis of nano-crystalline hydroxyapatite from dead snail shells for biological implantation, Trends Biomater. Artif. Organs,2 011, 25, 101–106. - M. Auta, B.H. Hameed, Chitosan–clay composite as highly effective and low-cost Adsorbent for batch and fixed-bed adsorption of methylene blue, Chemical Engineering Journal, 2014, 237, 352–361. - I.J. Macha, L.S. Ozyegin, J. Chou, R. Samur, F.N. Oktar, B. Ben-Nissan, An alternative synthesis method for di calcium phosphate (monetite) powders from Mediterranean mussel (mytilus galloprovincialis) shells, J. Aus. Ceram. Soc., 2013, 49, 122–128. - D. Cuenca-Solana, I. Guti_errez-Zugasti, M.R. Gonzalez-Morales, Use-wear analysis: An optimal methodology for the study of shell tools, Quaternary International, 2017, 427, 192-200. - K. Belgin, T. Fatma, D. Hakan , J. İlknur , Int. Environmental Application & Science, 2008, Vol. 3, 5, 373-380. - A. Aarfane, A. Salhi, M. El Krati, S. Tahiri, M. Monkade, K. LhadiE, M. Bensitel, J. Mater. Environ. Sci, 2014, 5, 1927-1939.